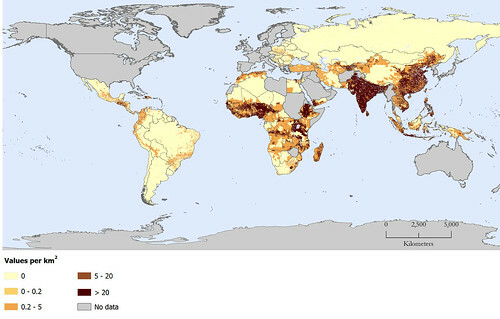 Distribution (density) of poor livestock keepers based on the international US$2.00/day poverty line in 2010 (published in a research brief by J Otte and R Leslie, Animal Health and Production Commission for Asia and the Pacific [APHCA], Jan 2013). ‘. . . [A]mong largely agrarian economies, which are home to the majority of the world’s poor, livestock are an integral part of smallholder crop-livestock farming systems. There is thus much greater scope for investment in livestock sector development for poverty reduction than generally realized, particularly in development that enables smallholders to take advantage of the growing demand for livestock products by more affluent members of society. . . .
‘Nearly three-quarters of the extremely poor—that is around 1 billion people—live in rural areas and, despite growing urbanization, more than half of the “dollar-poor” will reside in rural areas until approximately 2035. Most rural households depend on agriculture as part of their livelihoods and around 90 percent of the world’s extremely poor are small-scale farmers. Smallholders—however they may be defined—account for a considerable share of agricultural production throughout most of the developing world, particularly in South Asia and sub-Saharan Africa. In South Asia more that 80 percent of farms are smaller than 2 hectares. Globally, the numbers of poor livestock keepers have been increasing at a rate of about 1.4 percent per year. In terms of the absolute numbers of poor livestock keepers (less than $2/day), South Asia and sub-Saharan Africa dominate: more than 45 and 25 percent of the estimated 752 million poor livestock keepers live in South Asia and sub-Saharan Africa respectively. . . . Many rural poor keep livestock so this form of animal husbandry can make important contributions to sustainable rural development; as the demand for livestock products is growing rapidly in developing countries, diversification into livestock and increased livestock productivity should form part of any strategy for poverty reduction and agricultural productivity. . . .
A combined strategy for livestock and staple crop productivity growth, exploiting the close linkage between these two sectors, would have the strongest income-multiplier and poverty-reduction benefits. ‘Although there are many positive social outcomes that can be associated with livestock sector growth in developing country regions, there are some negative effects that need to be addressed. Two highly significant effects are the emergence and subsequent spread of infectious diseases associated with livestock and concomitant negative environmental impacts. The magnitude of negative environmental and public health externalities associated with livestock will be strongly influenced by the ways in which the livestock sector grows to meet the increasing demand for animal products. However the social benefits of supporting livestock-raising in low-income, largely agrarian economies significantly outweigh the negativities . . . .
‘The current expansion of markets for meat, milk and eggs in developing countries and their large degree of diversity represents enormous income potential for the rural poor, many of whom own livestock . . . . However, the benefits of growing urban food demand reaching rural smallholders and those that rapidly expand agrifood industries will depend to a significant extent on policy decisions. Regrettably, the potential of livestock for poverty reduction associated with appropriate sector development remains largely untapped. . . .
‘Most agricultural and rural households in developing countries constitute a group that is unlikely to be recruited directly into agrifood industrialization. Even intermediate stages of sector consolidation, like contract farming, appear to be undertaken at a scale well beyond that of the average smallholder farmer. Nevertheless, at the moment, urban demand growth represents an important opportunity for all domestic food producers, including smallholders, and this should be appreciated for its inclusive development potential. Read the whole research brief by J Otte and R Leslie: Investing in livestock sector development for poverty reduction, Animal Production and Health Commission for Asia and the Pacific (APHCA) / and the FAO Regional Office for Asia and the Pacific (FAORAP), APHCA Research Brief, Jan 2013. Tags: APHCA, FAO, FAORAP, J Otte. Bookmark the permalink. Ture, but the so called “rural poor” are not poor after all. I came up with one brilliant solution to this (The Global Livestock Bank) GLB, of which one but late reknowned international vet Dr Stewart Hargreaves was a member (may his legacy live on). The concept has received some international funding but it’s not enough given its magnitude. What it basically does is to solve the financial problems this group faces by unlocking the value in their livestock through an insurance product, backed by professional trainning in animal health, rangeland management and watering. This further goes on to create a financial instrument that the farmer uses to borrow against for further contracted livestock production or contracted crop production. This has been a success and more funds are needed to properly set up the livestock banks which would translate to livestock shares. To me, these people are not poor, but they have been excluded from all financial models simply for lack of innovation on the part of funders. For example, in Zimbabwe, there is probably 3 to 4 million herd @ an average price of live value of $400/beast, this translate to $1.2 billion! If only half of this value is unlocked, what will happen to this sector and agriculture in general?